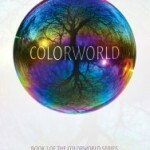 Rachel Kelly is the author of the Colorworld series. I met her last weekend at the AwesomeCon convention here in Washington, DC, and my wife and I bought all three of her books. Both of us love them so far, and I invited Rachel to come onto the site for an interview. I wanted it to be the story I had always wanted to read. So this is a superhero story. One without spandex and capes, and full of real people with everyday problems… but also some not-so-everyday problems. It’s about real talents that have been enhanced and existing in this world that we all now know. 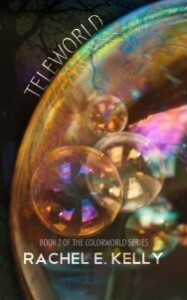 There are currently three books out: Colorworld, Teleworld and Lumaworld. 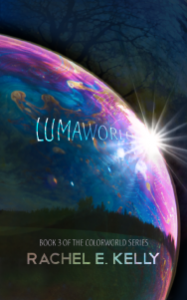 Book four, Shadoworld, will be out later in 2015. And Rachel says that books five and six are already written. 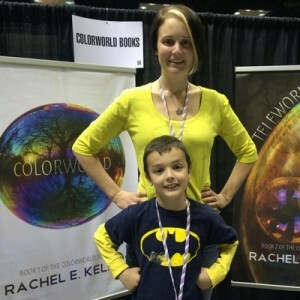 Rachel, along with her husband Brad and their four children, is on tour across the country, going from city to city and event to event in an RV promoting Colorworld, and you can follow the tour at her website (www.colorworldbooks.com). You can also follow her on Twitter, on Facebook and on her Amazon Author Page. I’ve got a great interview with both Rachel and Brad, and this is unique for me because it wasn’t done over email as these usually are, but live on the phone. So any errors or misstatements are entirely the result of me mistyping or not transcribing correctly. Brad: It was William Shatner (he began with the Tekwar novels, and since then read everything that Shatner’s written). Now, it’s Rachel. Rachel: “I’ve been told it’s lyrical, like literary fiction but literary science fiction.” She focuses equally on character and plot. A good story should include relationships, analyzing all the details of life. Brad: “If you would read Guardians of the Galaxy instead of watch it, it would be like Colorworld.” He loves the dialogue. Have any of your characters been modeled after yourself? Rachel: “They all have been modelled after myself. There’s a piece of me in all of them. Less so the villains.” The characters all include aspects of herself she likes, aspects she wishes she had, and embody things she’s working on being. Negative traits come from things in the past she’s been able to look back on and analyze. Brad and Rachel both noted that it’s weird to hear people talk about the characters, discussing them as though they’re real people. If you could exchange lives with any of your characters for a day which character would you choose and why? Brad: Ezra – so he could talk with Gabriel. Brad: “The Dark is Rising.” It first got him reading. Also Ross Perot’s book. It inspired Brad to join campaign, and got him involved in the Reform Party. He embraced the idea that he could have a much larger impact on the world, maybe even become President someday. If you could select one book that you could rewrite and add your own unique twist on, which book would that be and why? Rachel: “Containment” by Christian Cantrell. It’s a science fiction novel about a colony on Venus. It had an amazing concept, but she didn’t like where the book went. She also mentioned Hunger Games, throwing out the last book. “I want to change a lot of books.” She said that she often wishes the books she reads would do more, push the envelope with their ideas. Brad: The Monkees. He sometimes finds himself singing “Hey, hey, we’re the Monkees” but never finds himself singing a Beatles song. Who should play you in a film of your life? Rachel: Jennifer Lawrence. “Personality wise, we’re on a similar life wavelength.” Or America Ferrera, because Rachel would like to see how she would portray her. Brad: The Rock (Dwayne Johnson). He’s the guy they call in to fix a disaster, which is a trait Brad shares. Or Mark Wahlberg. “He has the same sort of swagger I carry myself with.” He’s kind of an underdog. Do they collaborate on writing? Mostly not. Rachel writes, and Brad handles the business end of things. Sometimes, Rachel does ask Brad what the characters (usually Gabriel) might do. At one point, Rachel did ask Brad whether or not to kill a character. Brad handles all the other media efforts (comic books, other artwork, etc). But as far as the books go, he doesn’t know what’s going to happen going forward. Rachel commented that her editor suggested that. It was either ignore the similarity completely, or acknowledge it. Rachel also talked about how those kind of pop culture details help to ground the story in reality, and in the time and place it’s set. Anything else about Rachel’s writing? The books (which are written in the first person present) were originally written in first person past tense. Rachel commented that she read “The Hunger Games” and loved the first person present viewpoint, and the way it made the story more immediate, and really put the reader into the character’s head, experiencing the story with them. So she rewrote the first three books in first person present. 10,000 Sales Giveaway and Contest!